What do you want to do before you die? Who do you want to be? How do you want to live? 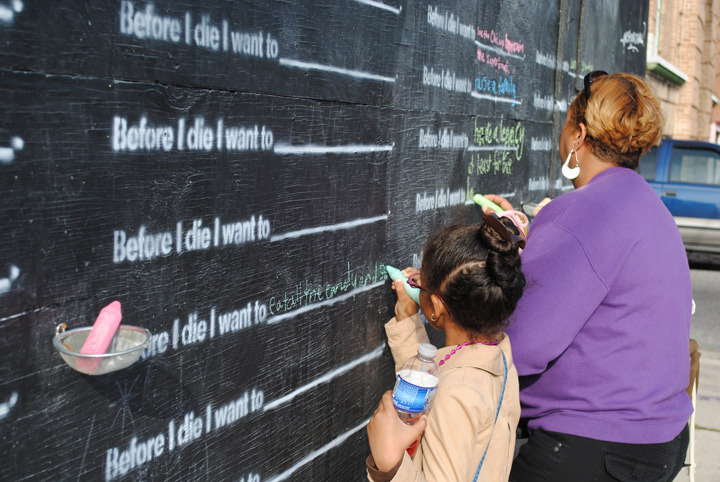 Taiwanese-American artist Candy Chang’s urban art installation project “Before I Die” is not about death. It’s not a bucket list of things to do and see before you die. Rather, it’s a thought-provoking way of looking at how you’re living right now. Are you realizing your potential in life? Have you achieved your goals? Are you honoring your highest good? 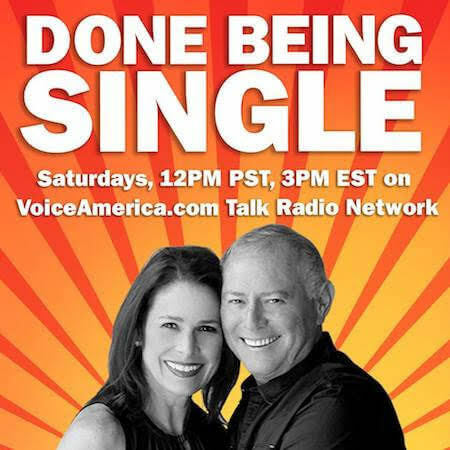 Are you getting the love you deserve? What are you grateful for? What’s still missing in your life? Life’s greatest questions now have answers, and they can be found on a chalkboard near you. In September, I moderated a panel discussion at a conference sponsored by the Motion Picture Television Fund (MPTF) called Deal With It: A Women’s Conference, held at the Montage Hotel in Beverly Hills. Part of the program included a breakfast keynote address by Chang. 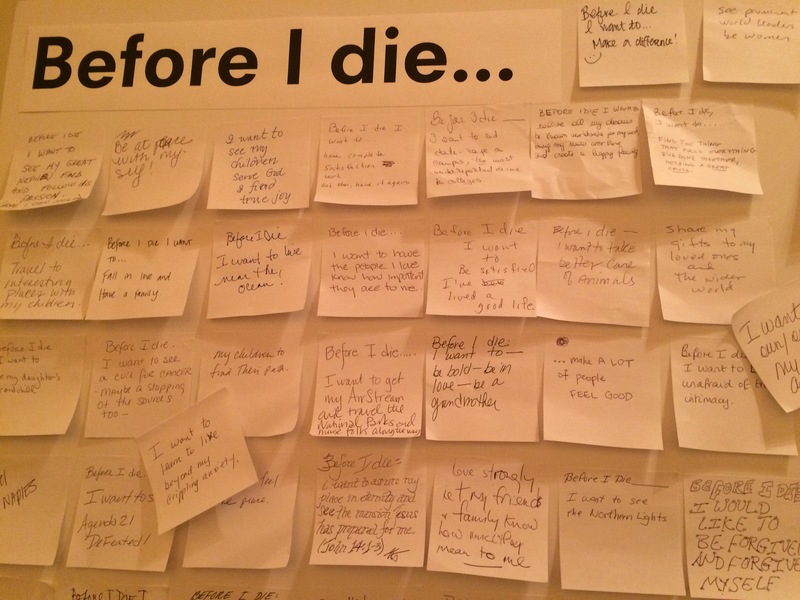 In her show-and-tell presentation, she introduced the audience to her piece “Before I Die,” a powerful, soul-searching exploration of the human condition. 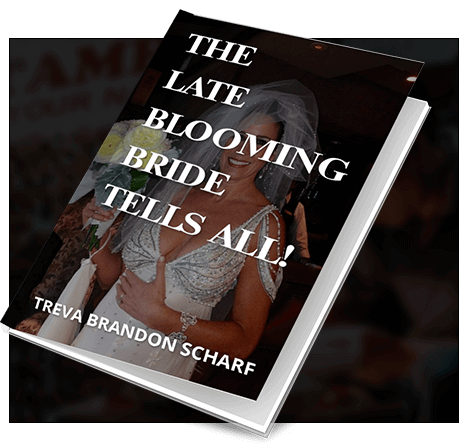 I was blown away by what I saw and what I learned. PAIN AND SUFFERING ARE UNIVERSAL, YOU ARE NOT ALONE. 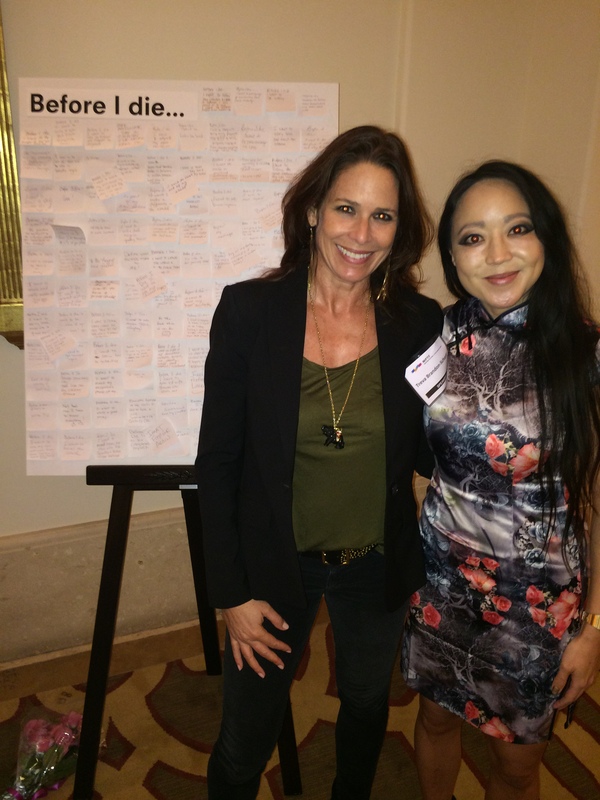 Candy Chang created “Before I Die” as an interactive global art project that invites ordinary people to share their personal aspirations, desires, hopes and dreams in the unlikeliest of spaces: on public walls, on abandoned buildings, on city streets. Not exactly typical places for self-examination and confession, but that’s what makes it so striking – the combination of its logistics AND the collective emotions it stirs up. 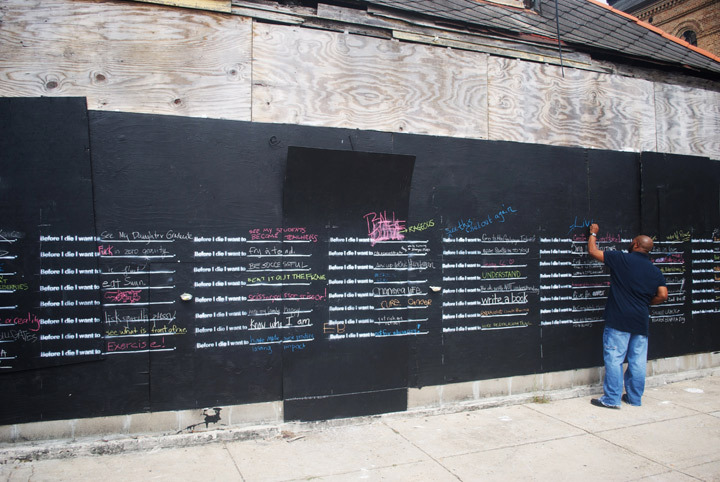 After losing someone she loved and falling into a depression, Chang initially created this experiment on an abandoned house in her New Orleans neighborhood as an anonymous place to help heal and share intimately with her neighbors. The project gained global attention, thanks mainly to the curiosity and passion of its participants. Since its inception, over 1000 Before I Die walls have been created in over 35 languages, in over 70 countries, including Kazakhstan, Iraq, Haiti, China, Ukraine, Portugal, Japan, Denmark, Argentina, and South Africa. 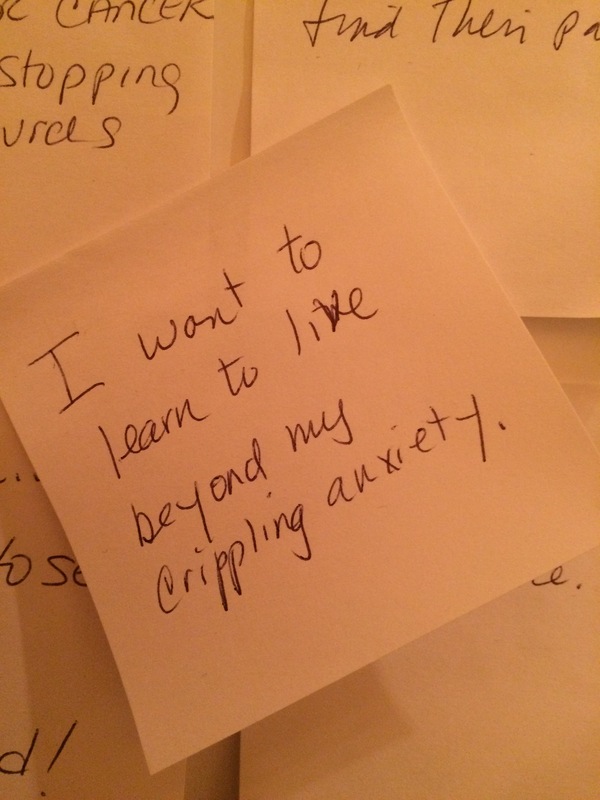 The walls are “an honest mess” of the longing, pain, joy, insecurity, gratitude, fear, and wonder that you would usually hear only in the confines of a therapist’s office or church confessional. Publically, the project brings communities together by fostering honesty, trust, support, and understanding. Privately, it allows people to let it rip. And boy, do they let it rip. With a simple piece of chalk, people bare their souls and unload their consciences. 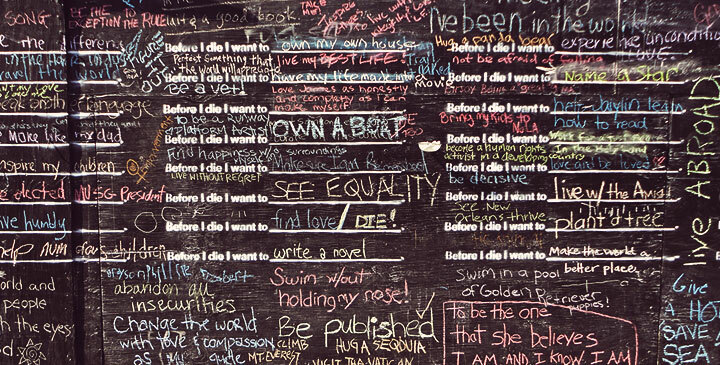 Responses on Before I Die walls range from hilarious to heartbreaking, from gutsy to gut-wrenching. You laugh, you tear-up, but most of all, you THINK. And that’s the purpose of the project: to be contemplative and comforting all at the same time. BEFORE I DIE I WANT TO…. It goes on and on, because life’s to-do list goes on and on. It never ends, and nor should it. We’re all imperfect creatures, works-in-progress that keep seeking and evolving. Everybody’s got some chalkboard goal they would like to achieve this lifetime. The question is: are you willing to make it happen, or are you willing to make peace if it never happens at all? I think you have to be prepared to do both. Whatever you do, don’t wait. Life’s too short. 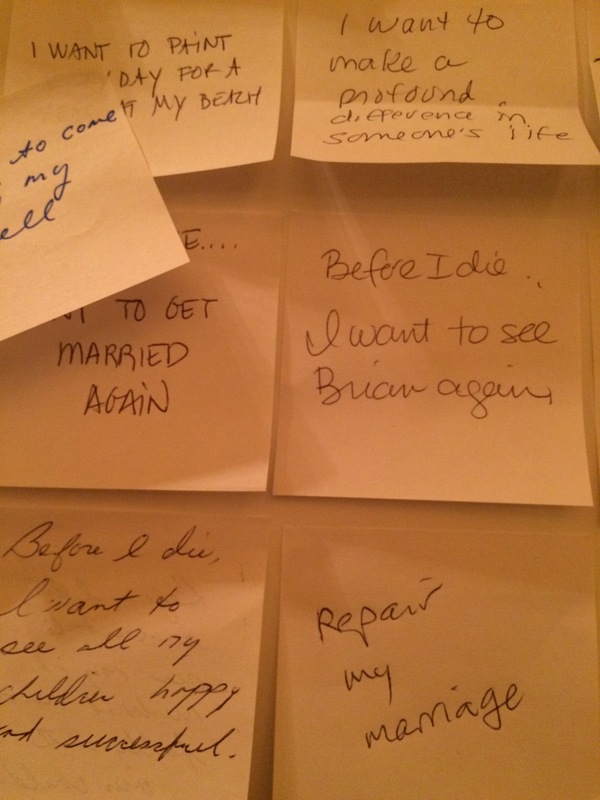 During her presentation, Candy Chang handed out Post-It notes to the conference attendees to scribble down their deepest, most innermost Before I Die thoughts. Afterwards, they were assembled on poster boards outside the hotel banquet room. 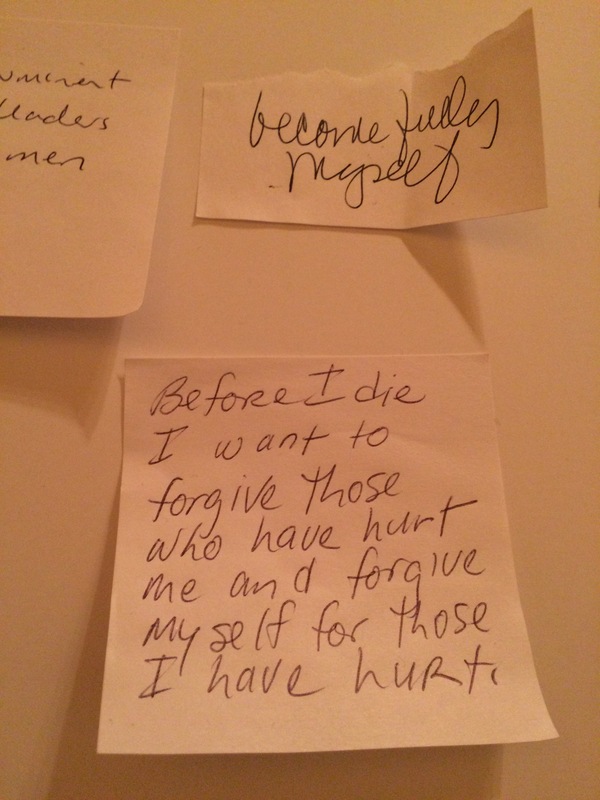 Like the responses on walls around the world, these were just as poignant, moving, and excruciatingly honest. You could feel the grief and hope in every word. My response is included somewhere in these Post-It notes. I can’t tell you where, but I can tell you this: I could’ve written any number of them.